One of my favorite lines in the song/poem/essay, that still stands out to me to this day, was, “Do one thing every day that scares you.” As a kid, I didn’t see how that was even possible. As an adult, I once again think it’s some of the best advice I’ve ever heard. On Monday night, I went to bed filled with nervous anticipation. Tuesday, I had an appointment at the hair salon. I have been growing my hair out for more than two and a half years. 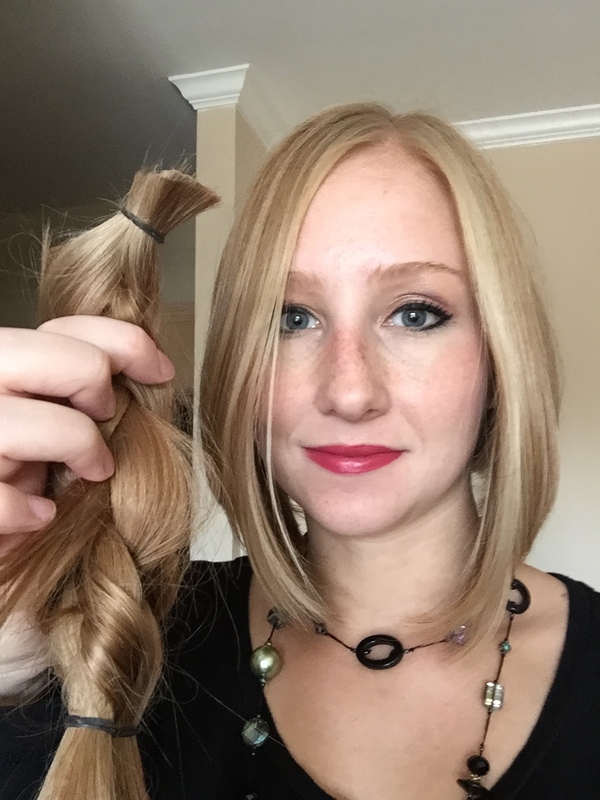 At some point, I decided I’d like to donate my hair for a wig for someone with cancer. When my friend and former coworker Loriana was diagnosed with Leukemia earlier this year, I knew that was what I had to do. My hair fell more than halfway down my back before I chopped it off. Until recently, I haven’t had long hair since my freshman year of college. So you can understand, I grew to be pretty attached to it. For the week leading up to my salon appointment, I shared short-hair pictures with my friends and family, and hoped I could go through with my plan. There was a feeling of “Am I really doing this?” all the way up to the moment my hair stylist, Meghan, chopped off my thick ponytail with her scissors. We decided on doing an angled bob, which I have always wanted to try out. But my stomach wrapped up in knots as I watched her razor off even more inches on the back of my head to make the style happen. 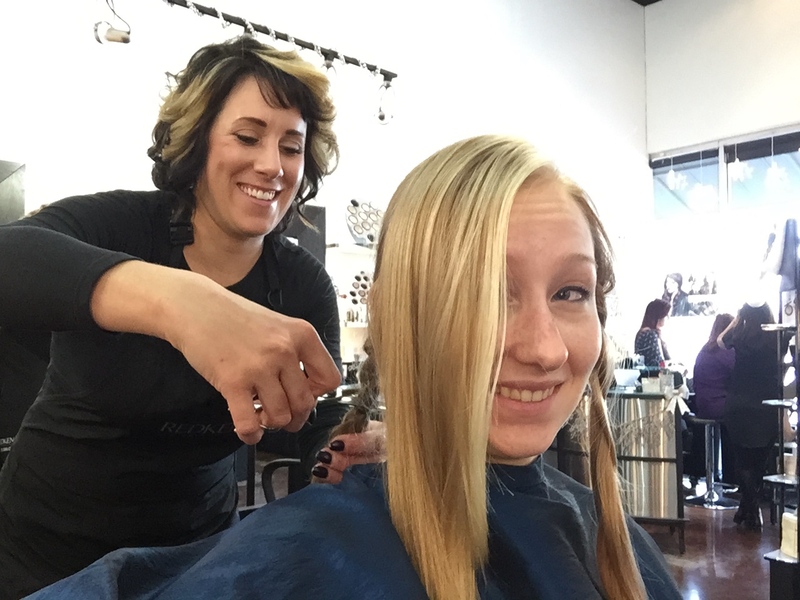 The moment of truth–chopping off my ponytail to give to Pantene Beautiful Lengths for women with cancer. After Meghan did her magic, I was relieved to see that I loved the shorter cut. And then there was the added excitement of seeing my ponytails on the counter, and knowing everything was worth it, to help out someone in the toughest time of her life. It didn’t hurt that I was flooded with compliments on my new style. 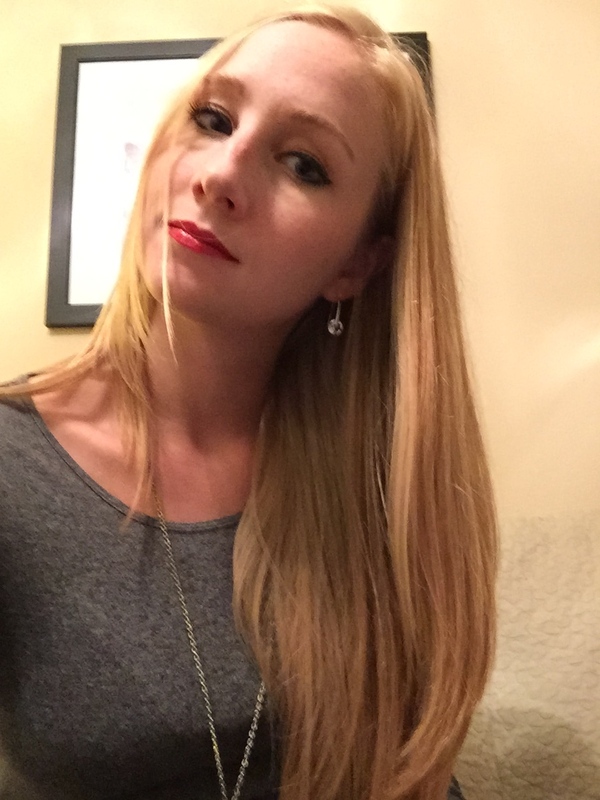 I posted a before and after photo on my Facebook page, tagging my friend Loriana, and had people I’d never met saying things like, “I don’t know you but you look more beautiful after giving the gift of your hair.” My coworker has been calling me “Gwyneth Paltrow” for days. The finished product! My new ‘do after giving away 10 inches of my hair. So what does this have to do with Baz Luhrmann and the sunscreen song? Before this week, I had been in a funk. Nothing really new or excited has happened in my life in a while, and I was in a place where I wasn’t looking forward to much. I wouldn’t say cutting nearly a foot off of my hair scared me, exactly. I know that hair grows back (and luckily, mine grows pretty quickly), and I was really excited for the new purpose that my hair was about to take on. But the drastic change in style certainly jarred me out of my comfort zone. I’m a person who typically does not like major changes in life, but this time, instead of being anxious or sad about losing what was, I felt incredibly energized. So now I’m challenging you to try to “Do one thing every day that scares you.” It can be as simple as standing up for yourself, instead of letting a mean comment go. (That’s another out-of-the-comfort-zone kind of moment for me.) You can go see that movie your boyfriend or spouse doesn’t want to see, by yourself. How about trying some weird food for the first time? I know I have a few big, bucket-list items that would get my adrenaline going, like skydiving. But I realized this week that it’s important to push myself into uncomfortable territory in smaller ways, more often. I realized it can be life changing.